Sundew (Drosera rotundifolia) is an evergreen Perennial, carnivorous plant. The leaves are arranged in a basal rosette. The narrow, hairy, long petioles support long laminae. The upper surface of the lamina is densely covered with red glandular hairs that secrete a sticky mucilage. The blossoms grow on one side of a single slender, hairless stalk that emanates from the center of the leaf rosette. White or pink in color, the five-petalled flowers produce light brown, slender, tapered seeds. The plant feeds on insects, which are attracted to the glistening drops of mucilage, loaded with a sugary substance, covering its leaves. It has evolved this carnivorous behavior in response to its habitat, which is usually poor in nutrients or is so acidic that nutrient availability is severely decreased. The plant uses enzymes to dissolve the insects, which become stuck to the glandular tentacles and extract ammonia and other nutrients from their bodies. The ammonia replaces the nitrogen that other plants absorb from the soil, and plants that are placed in a high-nitrogen environment depend less upon nitrogen from captured insects. Common Name: Round-leaved sundew or common sundew. It grows well in full to part sun. In indoors, it prefers bright light. Use live sphagnum moss or a half-and-half mix of peat moss and horticultural sand. Water your plant regularly and always keep the soil evenly moist and never allowing the soil to dry out. It thrives well in cool to average room temperatures 60°F – 75°F / 16°C to 24°C. In winter, a cold rest is needed 32°F – 50°F/ 1°C – 10°C. It will tolerate a little frost. High heat may cause dormancy. Do not fertilize because it will burn the roots and may kill the plant. If grown outdoors they will catch their own food. You can also sprinkle goldfish flakes on sundew leaves. 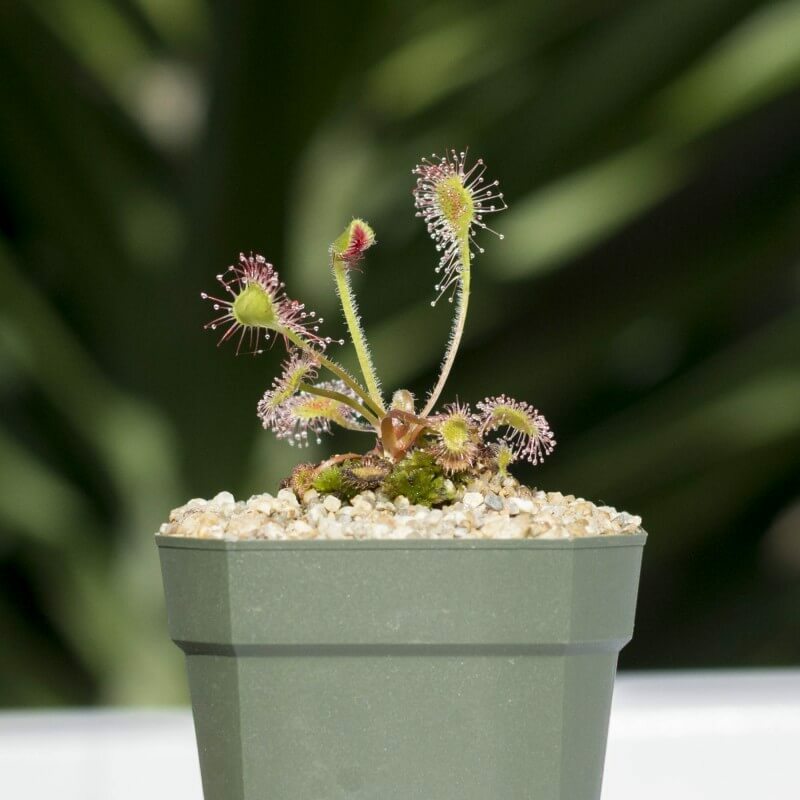 Since sundews are unlikely to catch insects in the house, you can feed it dead flies spring through fall. 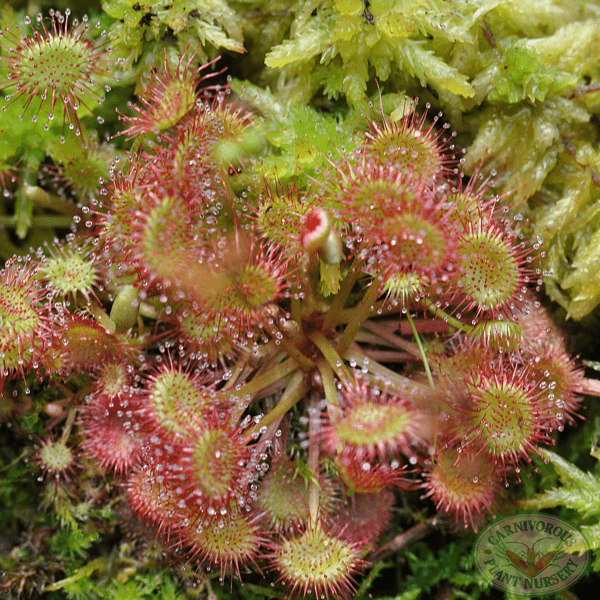 Round-leaved sundew can be propagated by seeds or division. Sow the fresh seeds in peat moss. Place the pots in a warm window or under bright lights. Seeds germinate in about two to four weeks. To divide, isolate new rosettes that form around the parent plant.